Divorce can be a lot like having the rug pulled out from under you. You've grown accustomed to living one way, on a certain amount of income, and suddenly, you realize that is about to change. You have rights, but they differ from state to state, and they can depend on the personal circumstances of your marriage. In all likelihood, you won't walk away empty-handed. You're usually entitled to a percentage of all marital property. Any property or assets you brought into the marriage are typically yours; you don't have to share them with your spouse if you divorce. The same holds true for property you received by gift or inheritance during your marriage. This rule is close to universal, but a few exceptions exist. For example, in Ohio, a judge can award some of your separate property to your spouse under extraordinary circumstances, and he must explain why he did so in writing. It's also possible to commingle or transmute your separate property into marital property if you take certain actions during the marriage, such as retitling it in joint names. Marital property – that which spouses acquire during the time they’re married – is divisible in a divorce. You're entitled to a share of this, but how much of a share depends on where you live. Most states are equitable distribution states; if you live in one of them, there's no surefire way to predict how much of your marital property the court will award you. 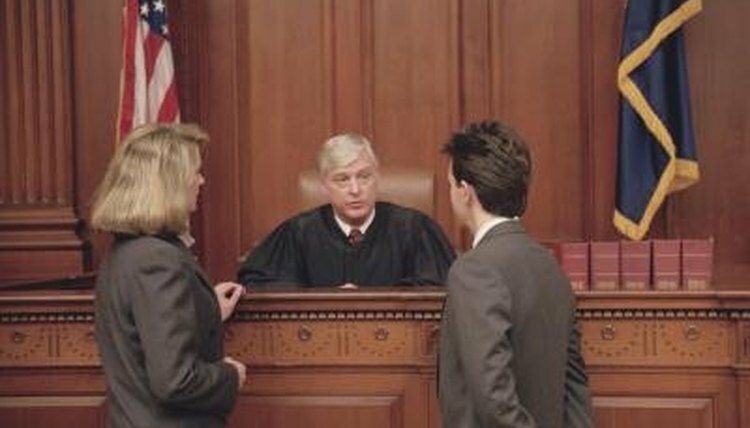 Equitable distribution is based on the concept of fairness; a judge examines various factors unique to your marriage and decides how to divide these assets accordingly. For example, judges in Ohio will weigh how long you've been married and whether you have custody of your children. Virginia considers marital misconduct – if you committed an act that ended your marriage, this can affect property division. Courts in many equitable distribution states begin with the assumption that marital assets and debts should be divided 50-50, then they work from there and make adjustments, taking statutory factors into consideration. The final division can be 55-45, 60-40, or even more uneven. If you live in one of the nine community property states, the portion of marital property you're entitled to in a divorce is a little more clear cut. The community property states are California, Nevada, Arizona, New Mexico, Louisiana, Wisconsin, Idaho, Texas and Washington. In these jurisdictions, you own 50 percent of everything you and your spouse acquired during your marriage except gifts or bequests made individually to him. Therefore, you're entitled to half when you divorce. A few of these states allow their courts to tweak the equation to create an unequal division under some circumstances, however. For example, in Nevada, if you willfully waste or dissipate marital assets, the court can order you to reimburse the marital estate for these sums. If you lost $100,000 on a speculative venture your spouse was unaware you were taking, he might receive $50,000 more in other assets to compensate him for his share of the lost money. This is particularly true if you spent the money in contemplation of divorce. Spousal support or maintenance, commonly referred to as alimony, is not an automatic entitlement in divorce. In fact, if you've been married only a few years and if you have a decent job, you probably won't receive an alimony award, even if your spouse out-earns you by a great deal. Alimony is typically granted after a long marriage during which one spouse never or rarely worked and the other spouse supported the family. Even in this case, the award might be temporary or rehabilitative, lasting only a few years until you've acquired the skills necessary to support yourself. Alimony is intended to give both spouses similar lifestyles post-divorce when they've both invested a lot of time and effort into the marriage. Womans Divorce: Who Gets What in a Divorce? Illinois Legal Aid: After my Divorce, am I Entitled to Maintenance? Bird, Beverly. "What Am I Entitled to in My Divorce?" , https://legalbeagle.com/12292083-am-entitled-divorce.html. Accessed 21 April 2019.